We've heard of parents who use string tied to a doorknob to pull out their kid's wobbly tooth. But this father takes it too far. We've heard of parents who use string tied to a doorknob to pull out their kid's wobbly tooth. But this father takes it too far. Professional wrestler Robert Abercrombie also known by his ring name Rob Venomous posted a video on YouTube showing 8-year-old James tied to the back of his Chevrolet Camaro. 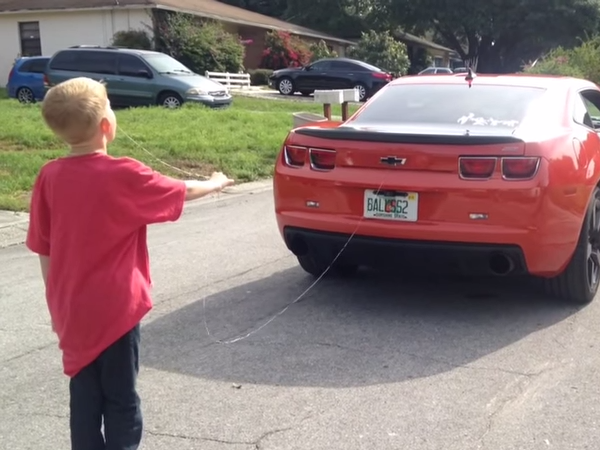 He then revvs up the engine to his muscle car pulling his son's front tooth clean out. "Tooth pulling never sounded so good", he captioned the video. Needless to say, please do not try this at home.